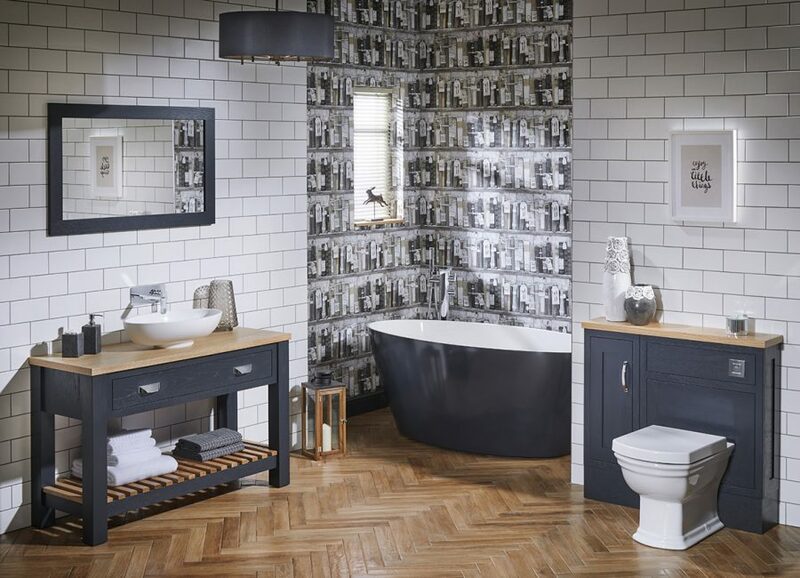 When planning for a new bathroom, cloakroom or en-suite, the chances are that there will be some tiling. Whether you choose to tile the floor, a splashback behind the basin or fully tile around the shower or bath, the design and shape that you select can make a truly stylish statement. Long gone are the days when tiling was just a commodity to act as a barrier against water. In fact, tiles have gone full circle and people have become really inventive in the way that their tiles are fitted. consider decorative and patterned tiles? 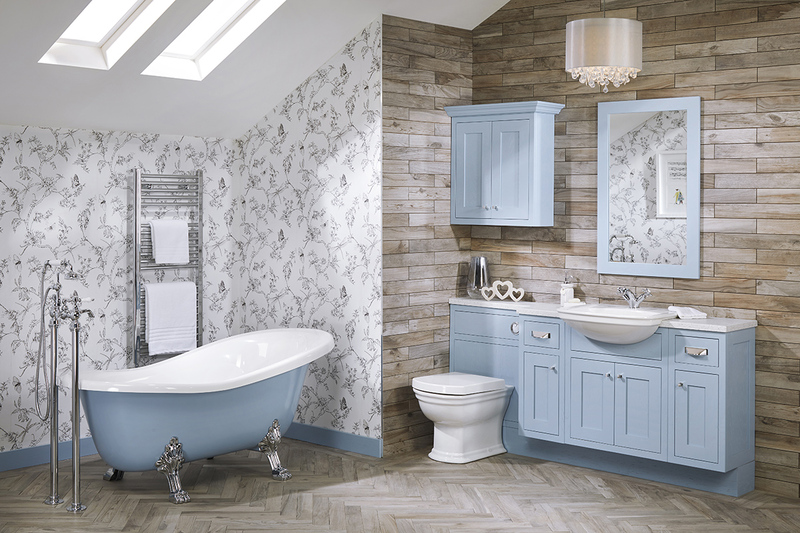 A repetitive surface print, especially ones that emulate the looks of original Minton or Moroccan influences will add decoration to your bathroom. Their eye-catching appeal is a sure way to creating a focal point or feature wall. Equally, an eclectic mix of different patterned tiles that have a common accent colour can look fabulous. At Vanity Hall we offer a bespoke painting service. 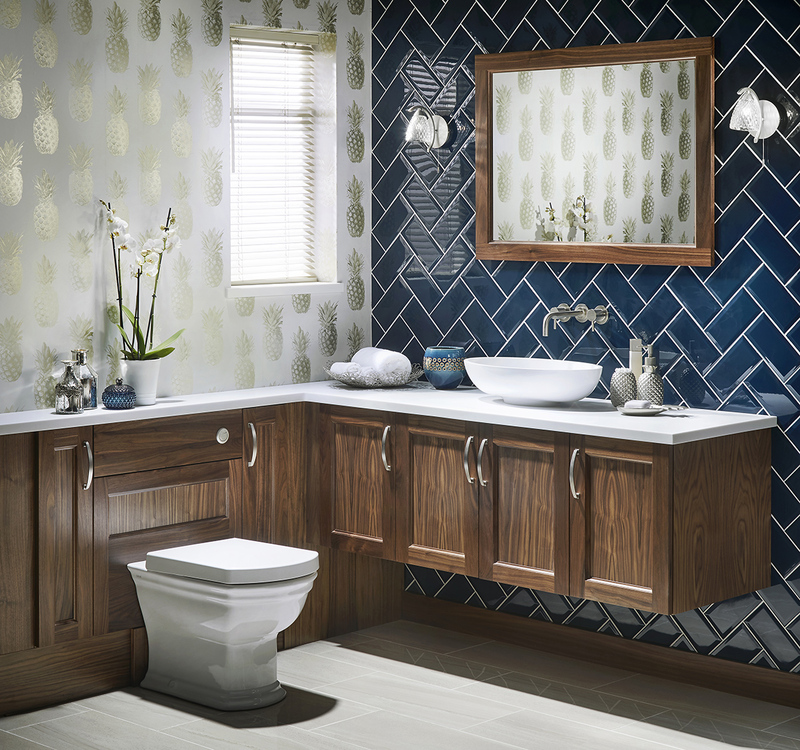 If you fall in love with a patterned tile, we can paint your new bathroom furniture in a finish of your choice to match. A lozenge or ‘metro’ shaped tile offers a variety of tessellating patterns. A true brick effect looks stunning, especially if a contrasting grout is used. 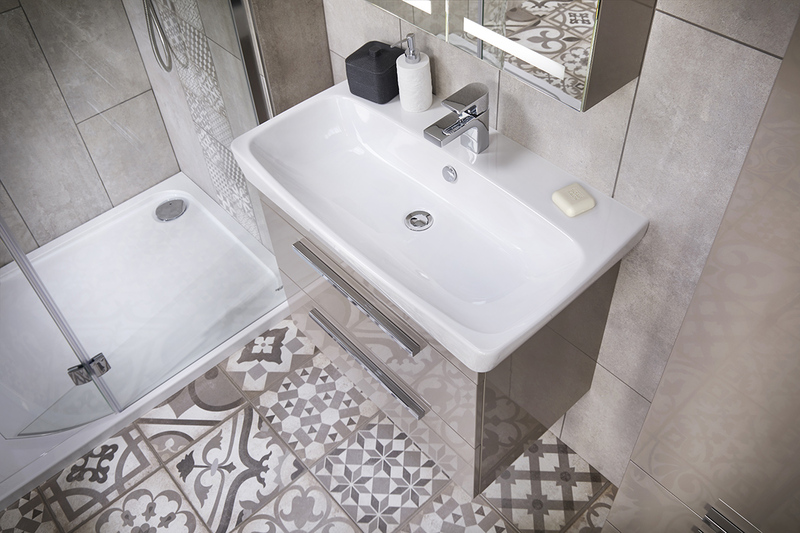 Nothing beats the sharp looks of a vibrant ‘metro’ tile in a gloss finish with crisp white grout lines. 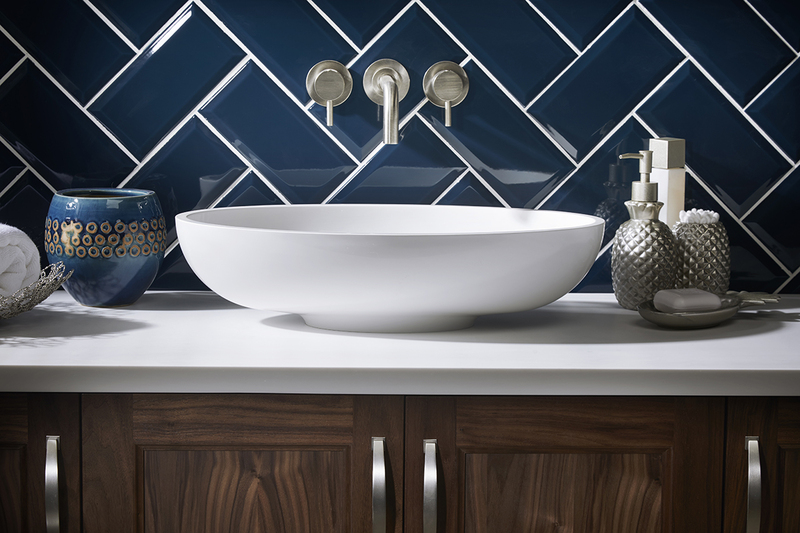 Alternatively, opt for a less bold tile colour and consider a dark shade for the grout? Woodgrain effect tiling is also having a resurgence in popularity. There are many sizes to choose from including planks. 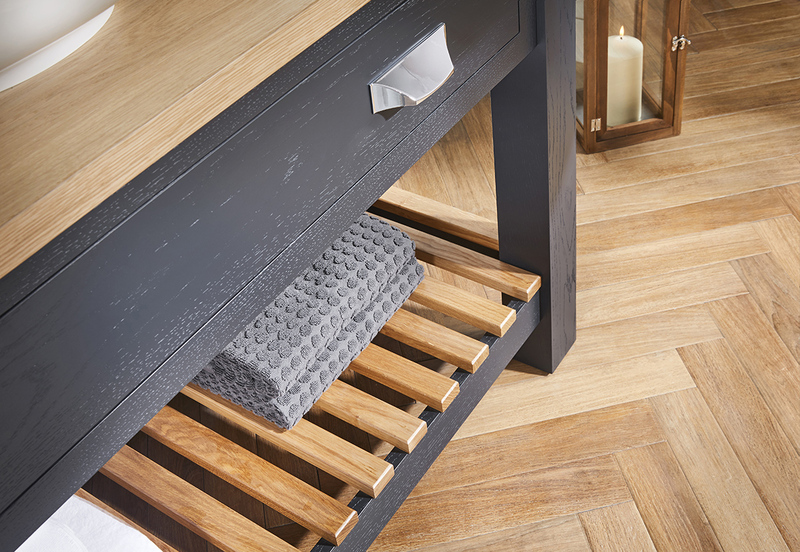 However, the smaller parquet sized versions can create real impact if installed on a floor in a herringbone pattern. Opt for a woodgrain finish that you can also use as an accent on your worktops or accessories. At Vanity Hall we realise that it can be hard to co-ordinate the overall scheme. That’s why we offer a sampling service for our door finishes. Plus, you can request laminate and Corian® worktop samples too, so you can be sure that the overall scheme will match beautifully. Get in touch and start planning your new colour scheme today!